An incredibly visceral (naturally) fantasy adventure. 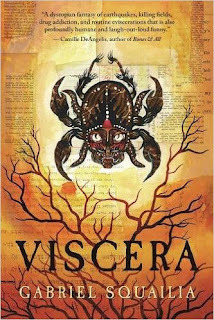 I can honestly say that Viscera isn't quite like anything I've read before. Which is to say, I'm not sure what I was expecting when I picked up the book. A thrilling fantasy adventure to prevent a great atrocity from being committed? Well…there's a bit that here, yes. 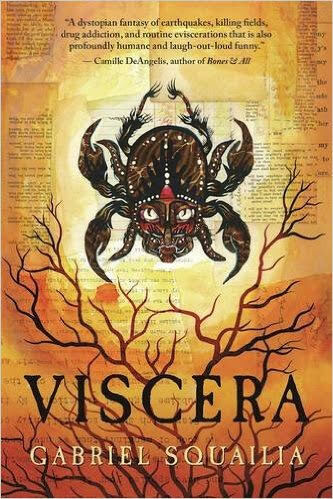 The story is fast and full of magic both blindingly bright and disturbingly dark, with a plot that dances along a razor's edge and characters drawn with compassion, nuance, and plenty of wit. But this isn't a conventional fantasy adventure. In fact, conventional is about the last thing I would call this novel. Instead, what's here is breathtaking in its originality, its innovation, and its wicked fun. As the title implies, it is a visceral experience that doesn't shy away from blood and guts and, well, just about anything. The plot follows a number of characters, and it is with its cast that I feel the best work is done. Not that the setting or plot or suspense or action isn't well done. It is. But the novel manages to capture with its cast san assortment of people struggling with the world they are forced to live in. Each person is both running from a past full of pain and grief and running toward a future where they might be allowed to hope and have some measure of peace. For Rafe, one of the viewpoint characters, it means running away from a family that misgendered him and a city that has taken the one person he cared for most away. It means living daily with the threat of discovery and violence. He starts the book and the future only stretches so far as the next hit, the next high, as he's become addicted to a powerful drug. As the book progresses, though, the future begins to open up again, bringing with it the chance at healing and wholeness. For Ashlan, the other primary viewpoint character and an immortal being who seems able to heal from any wound, it means running from the passions and hopes of her past and toward the promise of oblivion. It might be obvious by now that this is not the cheeriest of stories, though I will say it maintains a delightful dry humor throughout and a good dose of weirdness. When you have one of the characters being a murderous puppet animated by magical intestines and bent on revenge, and another a woman who travels with a stitched-together undead bear, things are kept very interesting. But there is a darkness that pervades the setting and the characters, and it's a darkness that is important right now. Because this story recognizes the shape of history and explores it through this fantastical lens. It's something that becomes more and more clear as the different characters are revealed, each from different points in time. Ashlan is the oldest, and has seen the most, and in many ways seems to me to be exhausted by the way that history never seems to change or get better. That there's always another atrocity waiting, another tyrant that will rise. And Rafe is the youngest of the characters, but even so he's disillusioned by the world around him, bears the scars of other people's hatred and intolerance. In between you see that there have been times in the city where queer and trans people have been accepted, where there was peace, but it didn't last. If there's a cycle at work here, it's one that begins and ends in violence and intolerance. There's an idea out there that history leans toward progress. It's something that's been shared a lot in the current landscape. But I don't really believe that. Or at least, I think progress is a loaded term. It's a way of saying that now is the best time. That we are the best people. The most enlightened. And I love that this novel shatters that idea. That it asks "progress for who?" Who is better off now, when these people face constant harassment and violence? And I love even more that the novel doesn't stop there. Because this is a beautifully hopeful and uplifting novel, for all that it explores trauma and violence. It seems to see the damage being done and doesn't rely on some historical perspective to make things better. Instead, it shows the power of people helping people. If the future is to lean toward progress, then it's going to take a great many people pushing it in that direction. For Rafe, for Ashlan, for the people of the novel—it's not about just surviving. It's about taking an active stance. It's about trying, even when it seems like it's hopeless. It's about having the guts to keep reaching not for progress but for compassion and empathy. Are you looking for a fantasy novel with a vivid and bloody setting and a sly, haunting mood? Are you hungry for a book with righteously queer and trans characters dealing with trauma and loss, hope and resistance? Do you yearn to read about an adventuring party made up of two drug addicted fortune-worshipers, a pacifist immortal, a murderous puppet, and a witch with her zombie-bear butler? Then read this novel. It's amazing. Negatives: -1 because MOAR zombie-bear butler plz!!! Nerd Coefficient: 9/10 "Exceptional!" see our full rating system here.